Here in GB, the weekly shop is allegedly dying out. Less and less of us, it seems, are driving to suburban edges to spend Saturdays pushing heaving trolleys down the aisles of impossibly vast supermarkets. According to reports, we now do more local shopping at smaller stores throughout the week. This can only be a good thing for humanity, I think. Smaller shops are much nicer to look at, for starters. They are not located in soulless aircraft hangar-like structures; they usually have a perky, striped awning of sorts and an artful window display to announce their trade. Shoppers inside them often have attractive baskets or pretty cloth bags to carry home their diminutive purchases, which add to the overall pleasing aesthetic of the small local shop. Small shops have a more human scale too. They tend to specialise in a particular thing, like pastry or fish, so you know they are experts in their field. Then there is also the opportunity to bump into neighbours or talk to the person at the till, who is likely to be the same person on a regular basis. There is comfort in such expertise and familiarity. But forget humanity for a moment. How would I feel, truly, if supermarkets disappeared tomorrow? Given my pronounced opinions on food politics, it would be safe to wager I’d be first in line to sign the petition to ban them. But, and this is difficult to declare, I have a certain fondness for supermarkets. I might even regret their demise. Nostalgia, and curiosity, are to blame. Growing up, I remember the regular trips to our San Fernando Valley supermarket, Hughes. One of a number of children in the family, we would be piled into the way-back of the bright orange Volvo station wagon where we would ride dangerously unharnessed to the store. Upon arrival, I would head off dangerously unaccompanied to watch the cake decorating man. The cake decorating man lived behind a glass observation pane in the Bakery section. I did not really think he lived there, I was not that young, but it was always the same man and that was always where I found him. He had slicked-back hair under his paper cap and wore a tight fitting white t-shirt with short sleeves, rolled up Rockabilly style, to expose the anchor tattoo on one of his muscled biceps. Those arms would then artfully coax icing rose clusters out of sugary icing-filled piping bags onto the corners of huge rectangular iced cakes. Then, he would slowly turn them round on the spinning pedestal as he sprayed their petals delicate shades of food colouring pink. Sometimes, on my arrival, he would be just starting a cake so I could see the plain rectangle being transformed by small rosettes piped round the base and top edge, which was then sprayed an appetizing royal blue colour. I liked going to the supermarket. Years later, when I left for foreign shores, one of the first things to do in an unfamiliar city was find a supermarket and have a browse. This was partly due to budgetary constraints. In purely practical terms, it helped to stake out picnic options straight away. But mostly, it was really interesting. Supermarkets are about the ordinary stuff. Loo roll. Do they have many different colours or no choice at all? Are the sizes different? Bread. Is there a lot or none? Soap. Buy some and bring it home as a souvenir. What kind of apples do they have. Biscuits. How can you not be captivated by the biscuit aisle of a foreign supermarket? And how are the mores and values of a nation reflected in the biscuit aisle of a supermarket? I have no idea but it is fun to have a peek. Small foreign shops are interesting too but the big volumes reveal more. Have you ever seen the yogurt aisle of a French hypermarché? The range is staggering and what it tells you is that yogurt is important to the French. You simply will not get that sort of information in the Louvre. So, supermarkets. They offer flexible employment options. They make food affordable, sometimes, though not always by the best means. They are cultural repositories. When I think about the pros and cons of big shops vs. small ones, I can only think about it terms of what I know. I love my neighbourhood because it is ‘walkable’ – which means I can get almost everything I need simply by walking out the door and going to the nearby shops, three of which are pared-down versions of big supermarkets. I do most of my drudgery grocery shopping, the repeat staples, online. I think the patisseries of France are unrivalled in their beautiful displays of éclairs, gateaux and other gourmandises, but you never get to watch people making them. I know it’s because they all start work at 3 a.m.. I’m just saying. A bit of live cake decorating is a human experience worth having. Like them or not, maybe what is happening is simply a shift, not an abolition in progress. Maybe it will make supermarkets better. Maybe what we need is more ‘medium’. This is a French recipe, designed to be made with individual pots of yogurt and the pot is the measure. I generally use plain set yogurt for this but you could try with flavoured yogurt too. It is quintessential home cooking so do not expect a rich, elaborate cake. It is plain, deliberately so and sometimes this is just what is needed. I like it because it is easy and leaves very little washing up. This is great to make, and eat, with children and the perfect accompaniment to mugs of hot chocolate. There are loads of variations, I’ll put them on the Recipes page. Preheat the oven to 180°C, line a 20-22 cm round cake tin with parchment. Put the eggs in a large bowl and beat well. Add the yogurt, then wipe out the pot so you can use it to measure the other ingredients without them sticking. Add the sugars, flour, oil, bicarbonate and salt and stir until well blended. Transfer to the prepared pan and sprinkle the top evenly with the cinnamon sugar. Bake until golden and cooked through, 30-40 minutes. Let cool slightly, then turn out to a wire rack to cool completely. This entry was posted in Essay and tagged Recipes, shopping local, supermarket, yogurt cake on January 30, 2015 by Laura Washburn Hutton. Great perspective with another delicious recipe to try. Love it! 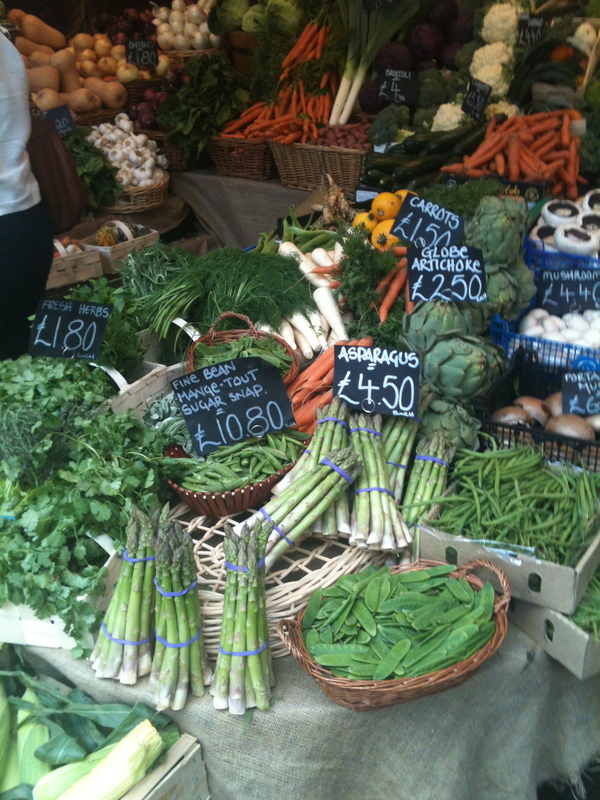 That veg stall looks amazing but, yikes, the prices! I think we’d all like to see hardworking farmers getting a fair price for their produce and I think we need to spend a little more to get good quality, but I reckon these prices would be beyond most households. They’re certainly beyond mine. (I pay about 30c per kilo for organic carrots at our local market.) I’m not coming down on the side of supermarkets, but until we have a viable alternative for shoppers on a budget I think we’re stuck with them. (This doesn’t even consider the issue that so many people don’t know how to cook from scratch and rely on processed foods – another serious issue that needs to be addressed for our collective health and so that more and more people can shop local to support their local economy.) But I do agree that supermarkets have a certain nostalgic charm and when visiting a foreign country I would much rather go to a supermarket than a museum! Yes rather alarming prices, I agree. The photo was taken at Borough Market in London last year. I was working on a project for them and was actually looking for budget options. I did find them, though not at that particular stand! Like you say, skill is key. In knowing how to cook but also how to shop, in any size store.